Just finished reading the October issue of Cooking Light (www.cookinglight.com, @cooking_light) and had to share this quote from Editor Scott Mowbray: "Life's a journey, if we're lucky, of about 82,000 meals. They should be good ones, and they should be remembered." Cooking Light, from time to time, does offer gluten-free cooking and baking tidbits. When I come across them, I promise to share them. Hi Blog Followers, Today was my first post in about two months. Wanted to let you know that I hadn't forgotten about you but my family and I moved out of state in June and it's been a busy time trying to get settled and juggle work and home responsibilities. I' m back to blogging and am hoping to post often as I explore what seems to be a celiac-friendly area. Thanks for following! Gluten-Free Goodness at Rite Aid! Imagine my surprise when I visited a Rite Aid in Syracuse and found a table full of gluten-free samples! Turns out, this store has its own gluten-free section. Check out the Rite Aid near you and see "what's in store!" For more details, see link below. Note caveat regarding gluten-free pizzas being baked in same ovens as pizzas that are not gluten-free. 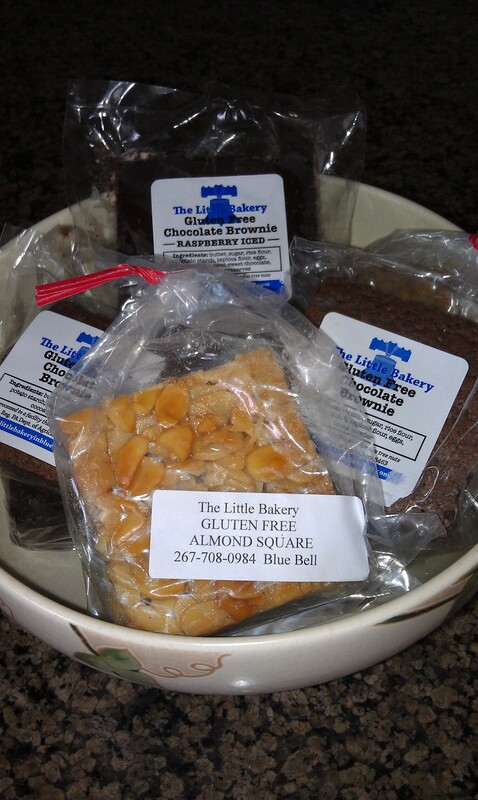 I recently discovered The Little Bakery in Blue Bell, Pa. through a promotion on Eat Shop Give. What a find! The Little Bakery offers some of the best gluten-free bakery products my family and I have ever tasted. My favorites are the Chocolate Chip Biscotti; my daughters loved the Chocolate Brownies, Mint Iced Brownies and Cheesecake Topped Chocolate Brownies. All products were shipped promptly and tasted as if they were baked that day. They stayed fresh for more than two weeks. Check out www.thelittlebakeryinbluebell.com or call 267.708.0984 and ask for John. Why pay for salad bar salads when they're a cinch to make at home for much less per serving? My favorite includes gluten-free turkey and roast beef, Craisins, slivered almonds and some fresh lettuce and tomatoes, topped off with a gluten-free raspberry or balsamic vinaigrette. Delicioso! On Friday, March 9, I had the pleasure of making a presentation to nurses in the East Penn (Pa.) school district. My presentation titled, "When a Child has Celiac Disease: A Guide for Educators and Healthcare Professionals" allowed for an interactive discussion about what it means to be a parent of a child with celiac disease and how to navigate the sometimes rough waters of living with--and educating others about--this condition. We talked about the condition itself, what it was like for my family from diagnosis to present day (my 20-year-old daughter has had celiac disease since she was 15 months old), how we handled the diet in school and social situations when my daughter was younger (including how to handle it when your child goes away to college) and what educators can do to help students on a gluten-free diet, among other topics. Thanks to Ann Johnson and all of the nurses I met on Friday. You made me feel welcome, and your questions and feedback were insightful. For information on how to bring this presentation to your school, contact Christine Krahling at WriteAtHome2012@gmail.com. The January/February 2012 issue of Women's Health has an article titled, "When Your Body Attacks Itself" by Tracy Erb Middleton. In it, Ms. Middleton presents case studies of different people with various symptoms and diagnoses. "Case Study 3" introduces a 22-year-old presenting with symptoms of celiac disease. The information discussed will probably ring true for many people who were at first diagnosed with another condition before receiving a diagnosis of celiac disease. Alessio Fasano, MD is quoted within the case study. As I'm sure readers of this blog know, it is frustrating to read inaccurate accounts of what celiac disease is/is not, e.g. an allergy or a condition one can outgrow. Kudos to Women's Health for recognizing that it has an intelligent readership and for sharing accurate information with us.